Now that Apple has given the green light for OperaMini to be a free download in the App Store, everyone has been installing the browser on his/her iPhone. As we recently reported, because the Opera browser is said to be 2.5 times faster than mobile Safari, over 1 million copies have been installed after the first 72 hours. And while the download might be allowing iPhone users to surf the web faster, tests show that sites do not render as well as they do on the iPhone's native browser. The problem could be with each browser's rendering engine. 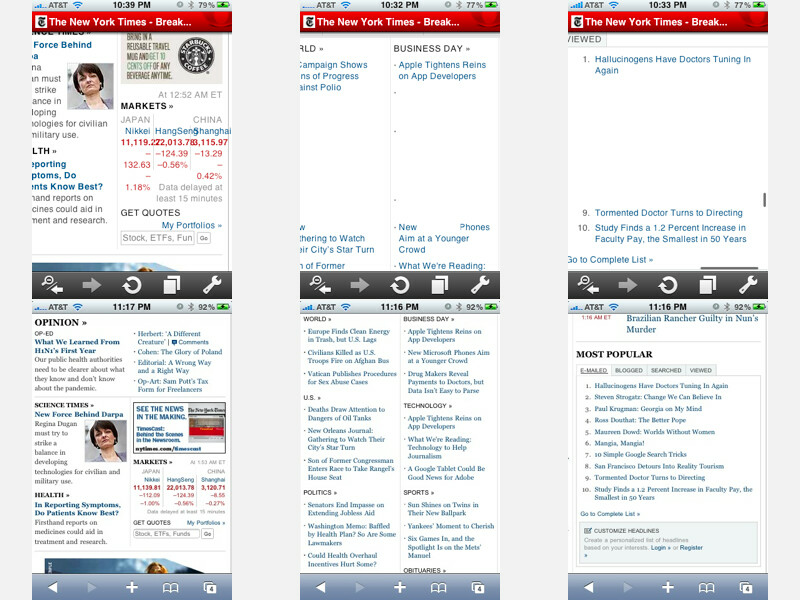 Mobile Safari uses WebKit while Opera uses its home grown Presto. If you look at the pictures below of the New York Times on Safari (bottom) and Opera Mini (top), you can easily see the difference in rendering between the two. This happens because of the way certain features are stripped from web sites as they pass through Opera's proxy server in the name of saving time. The result is faster browsing, but poorer rendering. 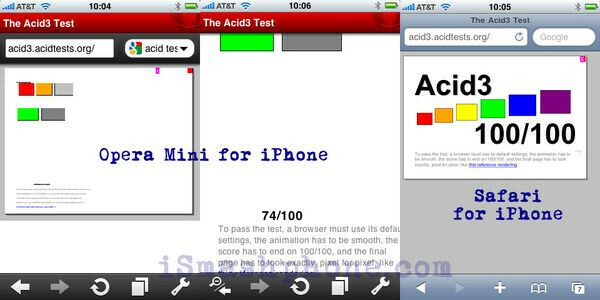 TheAcid3 test is a test done to compare how well browsers stack up against each other side by side. A "100" is a perfect score and the best result from a series of cellphone browsers belongs to mobile Safari which scored a 100 despite some rendering flaws. Opera Mini scored a 74. The Google browser on Android 2.0 scored a 93. So while Opera Mini for the iPhone might be quicker than mobile Safari, what you are gaining in time you might be losing in the quality of the downloads. Has anyone noticed major differences between the two mobile browsers? Maybe it has something to do with the network. Just a guess, no? Maybe it has wifi issues like daddy iPad....hmmmm, why don't I own apple again? Lol because you're apple hating scum that tries to talk trash at any given point. You're basing your comment on an application detailed for iPhone users, when in fact, Opera mini has been out for all phones and pretty much it proves safari can render pages better than opera mini on the iPhone. I'm sure there will be an update, just like on any phone with any application, including android. So run along to the next apple article so I can laugh at your next ignorant comment. How can you type with your mouth so full! Haha because scum is a classy way of calling someone trashy. This article had absolutely nothing to do with the competition between phones and carriers, yet someone has to leave some stupid comment on this website, obviously because it has to do with iPhone and from there, leads to AT&T. Sure that also explains why this article states its in the top Downloads section of the Apple Crap store...why dont you read...Safari is nice, so why so many downloads then? Well I don't think it has anything to do with the network, since Opera Mini is the #1 download globally, in all 22 app stores. People just want to have a choice, and are curious to see what this new browser brings to the table. No matter how fast your network is, a faster browser is definitely something worth checking out. I'm gonna keep it on my phone, but it's not going to be my main browser, due to the rendering issues. Now we know why Apple let this app into the app store...Sky Fire will destroy Opera Mini!!! Let them in!